The offseason hasn’t been all fireworks and barbeques for the Oregon baseball team. Their best hitter last season, Ryon Healy, signed a $500,000 deal with the Oakland A’s, who took him in the third round of the MLB draft. Young and promising pitcher Cole Wiper was also drafted and paid – the Texas Rangers signed him for a surprisingly high $700,000. Other key 2013 contributors Jimmy Sherfy, J.J. Altobelli, Christian Jones, and Brett Thomas were also drafted and will likely sign with teams in the coming weeks. So it goes with most top 20 teams in the nation. They have great players who eventually fly away to higher galaxies in the baseball universe. What separates consistently great teams from the one-year-wonders is their ability to replace lost players like umpires replace balls hit into the stands. This offseason, the Ducks look to be reloading every bit as effectively as they ever have. Even though many valuable players from last season aren’t coming back, the amount of talent that is returning is pretty scary considering these guys were good last year and will only get better. One of the biggest names is pitcher Cole Irvin who was recently named to Baseball America’s First-Team Freshman All-American Team. Irvin posted a 2.48 ERA over a team-high 116 innings, including gems like the complete-game one run performance against UCLA on April 20. UCLA won the College World Series, by the way. Yet while Irvin did an excellent Cliff Lee impersonation last season he can, and likely will, get better. He’s not an overpowering pitcher, so he won’t strike batters out at a Mark Appel-esque rate. However, he’s got such great command of all his pitches that he gets hitters chasing balls out of the strike zone without fear of giving up walks. Oregon’s two other main starting pitchers last year, Tommy Thorpe and Jake Reed, are also coming back. Let’s pause for a moment so that opposing PAC-12 batters can yell, swear and maybe throw some things around their homes if they’re so inclined. The last thing they wanted to hear was that this starting rotation was returning next year. Thorpe was arguably better than Irvin last season with a 2.16 ERA and a team-high 87 K’s in 104.1 innings. Reed was the underachiever of the three with a 3.50 ERA and 65 K’s in 100.1 innings. How can he live with himself? It’s hard to imagine three more effective, durable starting pitchers than the Ducks had last year. Imagine away as the 2014 Ducks might just accomplish this simply by having improved versions of those three. There’s obviously a chance none of them will improve or they will all (knock on wood) encounter injury problems, but there’s also a chance one of them will get struck by lightning while being attacked by a shark right after winning the lottery. Odds are they’ll be as dominant as they ever were. The lineup lost more than some pitching staff this offseason but plenty of key players will be back. Third baseman Mitchell Tolman either rode a season-long hot streak in 2013 or he’s just really good. The sophomore-to-be was one of the Ducks’ best hitters and really only needs to add some power to become a complete hitter. Even if he doesn’t, he’ll still be one of the team’s top hitters and might even end up their best. 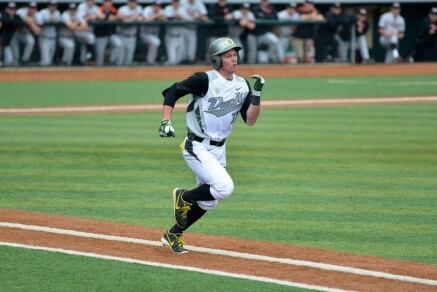 Starting outfielder Scott Heineman hit the second most home runs for Oregon last year, stole the second most bases and played an exceptional outfield, often in the uber-demanding position of center field. Ducks fans get to watch him do all of that again in 2014. Tough for them. Tyler Baumgartner, Aaron Payne, Steven Packard, and both catchers (Josh Graham and Shawn Chase) will also be back. This doesn’t even include the promising bench players who will get more field time in 2014 or the bevy of relief pitchers who were so great last season. The Ducks could get zero recruits next season and still have an excellent year. Unfortunately the Ducks lost outfielder Dane McFarland to the MLB. McFarland had committed to Oregon but decided to accept $300,000 offered by the team who drafted him – the Arizona Diamondbacks (12th round) – and jump straight from high school to pro ball. However, not all of Oregon’s recruits selected in the draft chose the money. 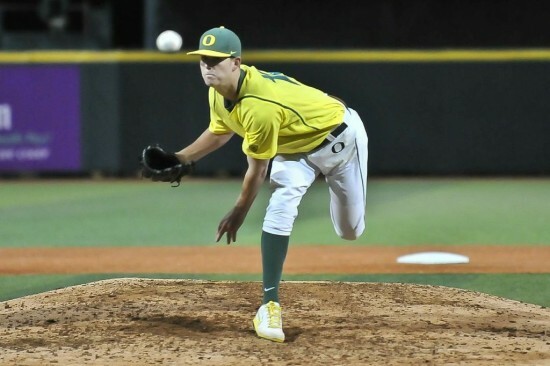 Matt Krook, a starting pitcher taken with the 35th overall pick by the Miami Marlins, decided to spurn South Beach and take his talents to Eugene. There were reports that Krook had issues with his physical causing Miami to lower their offer, providing incentive for the lefty’s detour into college. Whatever the reasons, the Ducks get a pitcher who was widely considered a top-50 draft prospect and one of the best high-school arms around. The Ducks might take it slow with Krook but one would expect them to do what they did with Irvin last season – plug him into the starting rotation and enjoy the show. Although Oregon used more than one pitcher as their fourth starter last year, they still utilized the fourth starter spot regularly. Krook will likely fill that role instead of forcing Irvin, Thorpe or Reed to the bullpen. So, the Ducks will have four great starting pitchers next season. How are you doing, opposing batters? Still angry? Try not to break the expensive china. Krook is the only recruit currently committed to play at Oregon next season but he won’t be the last. Once the Ducks get their other high school commits, this already promising 2014 season is going to blind onlookers with its brightness. The last two College World Series champions have come from the PAC-12. Don’t be surprised if the trophy comes to Eugene a year from now. The Ducks are building something special. *Don’t miss our football analysis every Tuesday, our Recruiting Update every Wednesday, and our new Chip Kelly updates every Friday!